Simple and Clean, and perfect for your Instagram photos, The Cube is an arrangement that can easily be displayed in any space and can grow in all directions as you add more square canvas photos to the arrangement with time. Printing your favorite digital pictures to canvas creates memories that can be featured in your home for all to enjoy. Fill a quirky space in your home with warmth and laughter and carry your memories for many years. The Cube can easily fit in small spaces, and can be displayed on both sides of another centerpiece or photo for an added interest. Use your imagination and create amazing arrangements with square canvas. There is a great feeling that comes with seeing your precious memories turned into beautiful gallery wrapped canvas. You already feel proud of your kids and the amazing pictures you captured, printing them on canvas will allow you to show them to family and friends with even more pride. Here at Mailpix we understand that life is a growing collection of memories, as well as a growing collection of images you can easily forget about and tuck away in a box. One of our favorite ways to bring those special moments back to life is printing them on canvas. Why not use The Cube to bring those pictures out for all to enjoy! The Cube is one of the most versatile of all our cluster arrangements. Since all four wrapped canvases are the same size there will be no need for you to worry about ruining your arrangement if you want to switch the canvases around a few months down the road or add more square canvases as your memories grow. Adding your digital photos to canvas is a beautiful way to display your favorite smiles all year long. Your little ones have such gorgeous smiles and you capture them all the time. Why not create a collage from your favorite to create a display of those precious smiling faces. 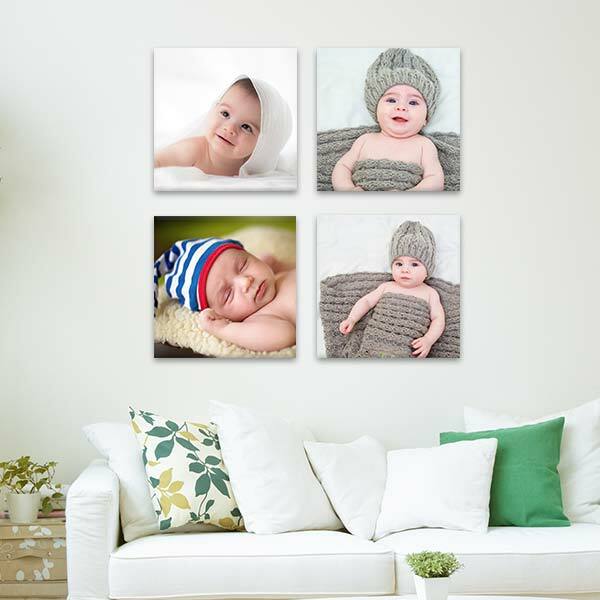 The square canvases are the perfect dimensions to showcase those joyful faces. As they grow and create new memories, you will easily be able to add to your cluster arrangement by adding more 12x12 square canvas to your display. There is no better way to create a photo canvas montage than with pictures of your baby's gorgeous smiles exploring their new world. The Cube cluster is the perfect arrangement to gather a beautiful picture of your daughter's newborn hand or your son’s tiny foot. How about that first time they saw the world and opened their eyes? All of these memorable moments hold a special place in your heart. Decorating your home with the intimate moments you share with your children brings all the joyful memories to life again. Your family and friends adore your children, share these meaningful stages in your life with them as well. Printing Images On Canvas For Gifts...Or Just For You! There are so many possible ways to capture the smiling faces you love and adore. Getting your pictures printed on a professionally wrapped canvas can add dimension and significance to any image you decide to print. Giving a wrapped canvas collection (such as The Cube) to your favorite person as a gift will create smiles over and over again. Seeing a precious photograph on the lightly textured canvas will add a great amount of joy to your loved ones. Take advantage of the many birthdays and holidays to give that favorite memory as a gift or get it printed for yourself. Use The Cube to highlight a wedding, an anniversary or an unforgettable birthday celebration with family and friends. 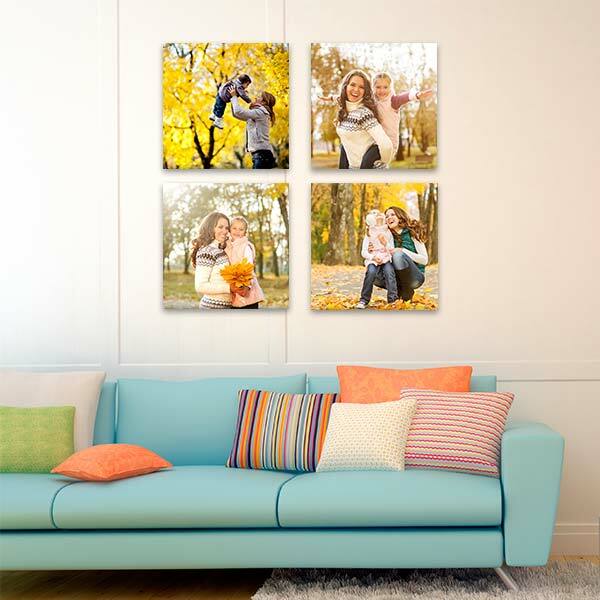 Just imagine how cozy your home will feel with a quartet of beautiful smiles on the wall. The Cube cluster arrangement is a favorite to give grandma and grandpa. They love their grandkids, why not print their favorite digital photos on canvas! Take them out on a field day to the park to get a few pictures of them walking with all the kids. A touching moment that can be enjoyed and shared for many years to come once it’s printed and hung. They will experience the joy of these special memories over and over again, even after the grandkids go home. Engagement pictures add a special touch to your wedding collection. They allow the bride and groom to share a moment or two within the planning and busy schedule that might be accompanied with setting up a wedding. Rather than just using the images solely for the invitations or save the dates you planned on printing, create a canvas cluster with The Cube with your four favorite poses to decorate your new home or apartment. You can then add to the collection later on once you have your wedding pictures…..and then of course, there is the honeymoon. Whether it be on a Mediterranean cruise, a luau on the beaches of the Pacific or a jungle adventure tour, you will have memories worth looking back on. Need a unique gift for a special holiday? Mailpix makes printing any digital photo to canvas a simple process, allowing you to enjoy your personalized canvas even more. Gathering the family for a memorable photo shoot will be the gift that will bring joy all year long once you have printed those precious images on The Cube. Includes Four 12x12 wide wrapped canvases, 1.25” thick. The Cube is the perfect cluster arrangement to feature your most beloved memories. Easily expand the canvas collection by creating more square canvas prints or add to any of our other cluster arrangements. The Cube comes with four 12x12 wide wrapped canvases that can be spaced and hung however you think best suits your wall space. Hang them in a vertical or horizontal row, form a shape or hang them in a random photo montage wall collection. The creative options are endless! However you choose to capture the warmth in your home, you are sure to find that printing images on canvas will bring a smile to anyone entering the room. If you are looking for other ways to display your best four photos, our Family Collection cluster makes a great addition to any decor style. Instagram is such a popular way to share square images. Sometimes those images can bring special memories back to life that you would like to share with more than just your followers. Printing your favorite Instagram moments to canvas will allow you to keep looking back on the special occasions you filtered so well when you don't feel like scrolling through the almost endless files of images. These are best printed with a solid colored edging rather than a photo wrapped edge....just a little tip before you get started. 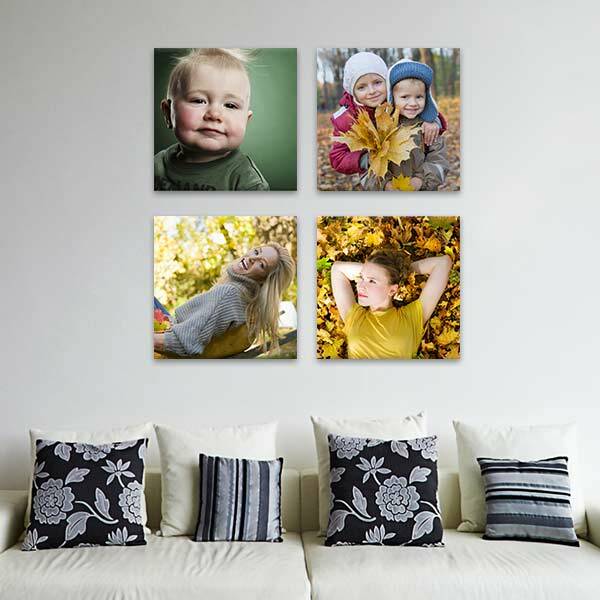 Want to create a photo collection on your wall with only Square Canvases? If you love the look of square canvases, creating a collection around your Cube Cluster with a variety of other square canvas sizes can add depth to your wall decor. With eight different sizes to choose from each square canvas will add dimension to your home allowing the creativity to be controlled only by you. Adding a little decor to a “not so roomy” area can get a little tricky. If you are looking for a canvas that is thinner and can stand on your mantle or nightstand (without cluttering the space) check out our Canvas Lites. The lighter, flexible canvas minis are ready to be enjoyed in minutes and will create the warmth and smiles you’re looking for in every room.